First off, sorry for the non existent blogging this last week. While I didn't have swine flu, I had something that left me little inclination to put out any effort. Our range trip started off to it's usual late self. 10 am turned into 11:30 and lunch for buddy Jason. We met up with his friend Butch, a local LEO. A new shooter was awaiting us at the range, having gone on ahead. Doug had purchased a Savage Arms rifle from his neighbor in 17 HMR. Doug also shot buddy Bob's Raging Bull. Here's Doug pictured below with the gun still in recoil. 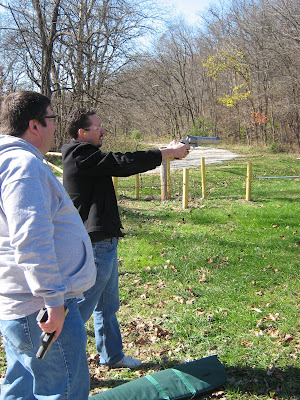 Buddy Jason accompanied Bob and myself to the range and he brought along his Springfield XD45. Here he is below shooting Bob's Raging Bull. I loaded the rounds for the .44 and tried the magnum primers for this particular batch. There seemed to be less sting with the magnum load as opposed to the large pistol load. That's Jason in the black coat with Bob in the foreground holding his Ruger two tome SR9. Bob loves stainless steel. We had another new shooter out there, Mike. 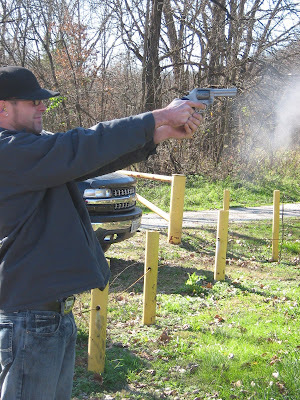 Here he is shooting a .357 magnum Taurus provided by another gentleman named Jason. 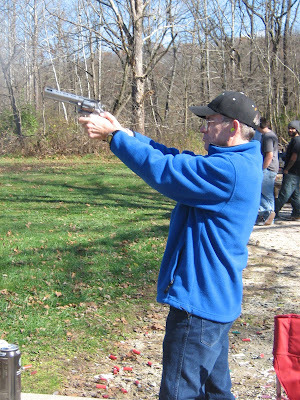 Mike was leery of shooting my Remington 870, but after a couple of rounds, he took to it like a duck to water. I wish I had pictures of him shooting that. Mike also really took to both of the Ruger 10/22 present. I can't think of a better platform to introduce new adult shooters to pulling the trigger than one of these guns. I think Mike is going to be visiting Cabela's soon. It was a beautiful day after the previous weeks rain that had us setting records for October rainfall. I guess the blogger did not feel "icky" anymore. One more "icky" and he get his man card revoked permanently. There was no mention of 'icky' in the post itself. There was mention of "icky" on the drive over. If I wanted all black drab boring guns I would have bought all black drab boring guns and saved money. I am sure the Gestapo or KGB will delete the above (2) comments. It should just be the "Leestapo".